I have a confession. I have grown up in church and owned a Bible the majority of my life but it wasn't until the last few years that I have actually started reading it. It's not that I haven't believed what everyone says about it being God's love letter to us but more that I just couldn't understand what I was reading when I opened it. But over the last few years the Lord has brought me resources to use in reading His word. Now when I read the Bible it feels more like an exciting time to dig into a great book rather than something I know I'm supposed to check off my list. Because of my own struggles in reading the Bible as a child I have a passion to see my kids and the generations to come be excited to read God's word. If you have spent time in the word you know how life changing it is. Reading it is not just a good thing to do but life to our body and spirit. We headed to Starbucks one day last week to do a little school work and brought the NKJV Study Bible for Kids with us for our Bible time. The girls absolutely loved it so I thought I would share with you some of their favorite parts of the book. Livvy chose to look up the book of Esther and Ellie the book of Matthew. One of our favorite parts of this book is the description it gives of each book of the Bible. As you can see it explains what the book is about, who wrote it, when it was written, why it was written and how it can be applied to our life. These spotlight sections are placed throughout the Bible which are great for a quick read or devotional. It breaks it down in a way kids can understand. Since this is our first year to homeschool I absolutely love this timeline section in each book. It's a great way to give the kids, and myself, a visual of when and where the story took place. My girls love these starring roles sections because they describe personalities of major people of the Bible. Epic ideas are placed throughout for the kids to read and learn more practical things about the christian life. The dictionary is awesome for those hard to read words that most kids, and adults, don't know the meaning. 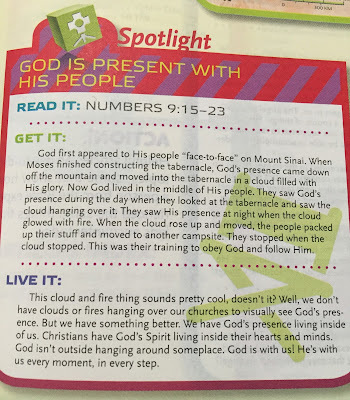 Would you like to win a FREE copy of this NKJV Study Bible for Kids from Tommy Nelson? Simply leave a comment below and answer this question: What are your favorite Bible study tools? Thank you for the review! We love studying the bible together. We have used the Family Bible for the past few years. It has a plan you follow through the bible and questions that go with your reading. We love it! Love that Jeana! What is the name of that one? This looks like a great study bible. It looks like a great opportunity to dig deeper into the word. Love it!